Ujire, Dec 10, 2015: Speaking after inaugurating the 83rd All-religion Meet organised at Sri Kshetra Dharmasthala on the occasion of Lakshadeepotsava celebrations on Wednesday, Dec 9. Stating that the cases of suicide of farmers are considerably reduced in the coastal region, as they have become self-reliant through projects like Sri Kshetra Dharmasthala Rural Development Programme. Vishwa Gayathri Pariwar Head Dr Pranav Pandya lamented that even though science and technology are developing in a rapid pace, poverty, malnutrition, exploitation of children and sexual harassment are also on the rise. There is plenty of intolerance in India. One can show love and faith to all. World is a family to those who are broad-minded, Pandya insisted. 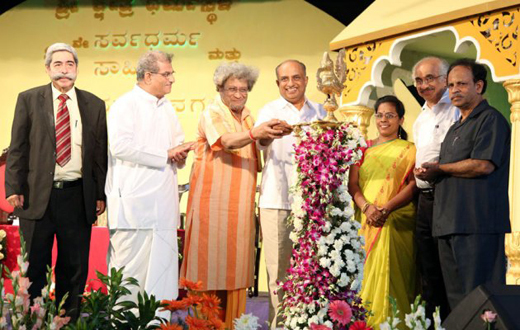 Sri Kshetra Dharmasthala Dharmadhikari Dr D Veerendra Heggade said that one should learn good about other religions. When this happens, our vision becomes broad and thoughts become deep, which, in turn, paves the way to knowledge and harmony. One should do deeds and utilise money to ensure that the desires are fulfilled in a righteous way and the whole world is benefited. The idea of an all-religion meet is to recognise the similarities among religions and not differences. Dr Heggade added that the All-religion Meet was started by Sri Kshetra Dharmasthala former Dharmadhikari Majaiah Heggade in 1933 and, since then, the meet is being held every year, during the Lakshadeepothsava celebrations in the temple. The Bangalore Parsee Zoroastrian Anjuman, Bengaluru, Secretary Shereyar D Vakil, spoke on the perspective of harmony in Parsi religion. Madras University Kannada Department head Dr Tamil Selvi, Chennai, spoke on the significance of harmony preached in Jain religion while writer Prof Syed Shahabuddin Hasan spoke on the values harmony as given in Islam. Prof S Prabhakar, D Surendra Kumar and Dr B Yashoverma were present.